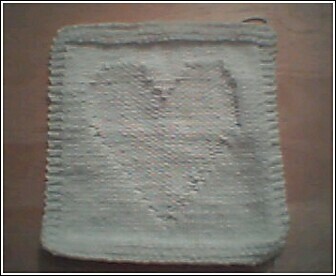 this is the first dish/washcloth i've made from the "dishcloths from the heart" booklet. i like using hand knit cloths for washing myself as opposed to washing dishes, but they are good for that too. i think the first one i made really spoiled me so now i use them almost exclusively. i like garter stitch ones. they feel soooooooo good when i wash my face! sorry the pic is a little on the dark side, but i had to do take the pic in lighting that would allow the subtle design to show up. but most of these cloths that i'm making are destined to become nice christmas gifts. i think a few hand-knit cloths, along with my favorite bar soap would make a nice gift for someone, don't you? Glad to meet another knitter/librarian. As for the Sherman heel, it turns out they posted a correction to the instructions in that issue of Knitters. Do you have the corrections? Maybe that's why the heel is a bit off. I've been trying new heels too, on my toe-up socks. And VERY glad you like the Librariansagainstbush button on my site! Oops, forgot to ask. What yarn do you use to knit your washclothes? yeah..what yarn did you use for the dishcloth?